Signifie en chinois : "qui regarde les quatre points cardinaux"
Voici un message extrait d'un long échange de mails avec des amis au sujet de la discrimination raciale aux Etats-Unis et de ses conséquences sur la réussite scolaire et économique des noirs. C'est un sujet qui commence à être d'actualité en France, ce qui se traduit par la tentation de la discrimination positive. Ce mail a été plutôt long à rédiger, et je profite donc de la fonction coupier/coller pour publier un article à peu de frais sur ce blog. Sorry to have let you down for so long. Set theory was keeping me busy, and I wanted to come back to you with a decent answer. So there we go. 1) Your claim: there is social and racial discrimination in our society and people suffer from it. • "Racism/inequality/structural exclusion, in their many faces, are a fact, a reality." • "I had a colleague in school [who] was told by her advisor to pursue a two-year degree instead of a bachelor's degree because she was Hispanic and a woman"
• "when you come across a book that doesn't support [this idea] you simply invoke lack of time as a reason for not reading it"
I am not denying in any way that racial and social discrimination exist and that people suffer from them. I don't know how it feels to belong to a minority in my country, and wish no one had to know (see also this book to understand why I didn't feel an urge to read The chosen). But the question I asked during our conversation in Luxembourg was different: do these discriminations really have a large influence on people's achievement in higher education (nowadays, in the US)? 2) My conjecture: at college level, cognitive aptitude is now more important than social origin to obtain a degree, and affirmative action has more than compensated the negative effects of racial discrimination. This is based on NLSY data as compiled in The bell curve. Overall, there have been some – although comparatively few – critics about the source data and the way the authors did their computations. What they claim is that once students reach the point of entering college, social discrimination does not make a huge difference, and affirmative action even makes life easier for a black student than for a white or an asian student. Note that this does not contradict the existence of discriminations. Although in my view this result is not very difficult to accept, many people reply that it does not compare like with like. In their view, socially or racially discriminated people either don't go far enough to apply for college, and when they do, their IQ only reflects the negative impact of their condition. To support this view, there is the lieu commun that "people are created equal", so that in order to be found unequal later they must have endured a different treatment. • Suppose that both groups had to pass the same standarized test. In terms of mathematics, they would certainly outperform the rest of us as a group. Does this mean that they had all a higher IQ? That they had all greater learning potential? That they were more mathematically adept than us? No, it means its simply a difference in curriculum. • I sincerely hope you abandon this (in my opinion flawed) fascination with IQ and The bell curve. • Does a 6 month old have the same IQ as a 6 year old? A 6 year old vs a 15 year old? • What does the variation in IQ really tell us about the person? [Can the IQ predict if a person is a hard worker? Disciplined or scatter brain? Musically gifted? A great novelist?] Can IQ really predict the level of productivity an individual will attain in the right environment? • Also, you might want to consider the discussion regarding standardized/IQ tests as cultural products or constructs. These are good questions to test the validity of IQ, and the answer to both of them is roughly yes (except for those between brackets). From what I have read, IQ is quite stable along the life of a grown-up child and adult, and is a better predictor of professional peformance than most other tests. As for artistic creativity, discipline and so on, psychologists consider them to be separate personality traits. They all differ from IQ in a very important respect: they are much less heritable, in the order of 40% or less versus 60% or more for IQ. Finally, IQ is correlated with biological variables such as cranial volume and the speed of some nervous reaction in the brain. So what exactly is IQ and how is it measured? Early in the 20th century, a psychologist named Spearman observed that scores in various tests were often correlated. Because they varied simultaneously, he thought that they could have a common factor which he named the g factor for general intelligence. The IQ test was then designed to extract the largest possible part of the variance of various other tests such as English, memory, math, SAT, etc. Because of numerous attacks against them, IQ tests have since evolved. Among the most recent versions, those based on Raven matrices are purely graphical, non-verbal and non-math, and well tested against cultural and social bias when taken under controlled conditions. In the Bell curve, the authors use scores from an armed forces test called AFTQ which is heavily loaded in g. From this perspective, it appears that many things that we considered to be largely determined by our social and cultural group, such as economic and educational achievement, are nowadays related more to IQ than to anything else. This being said, we know very little about what might influence IQ apart from genes. This is a surprising statement, as we would have expected parenting and schooling to have a major influence. In fact, it seems that the non-genetic variance of IQ has little correlation with our family environment, and education programs such as head start or even more intensive programs seem to have almost no lasting effect on IQ. From what I have read, this remains an open question in modern psychology (see for instance this book). Of course, it is true in our countries only because the vast majority of children get a decent environment and education, and it does not preclude that a dramatic environment can permanently alter a child's development. So, going back to our question about higher education, what if people actually do run the same race, but have different aptitudes either for genetic or unknown reasons? What should we do about it? • I find it insidious, and downright dirty, to suggest, even if indirectly, that one racial group (in this case, black) might be intellectually inferior to others. • Focusing on the supposed inferiority of a group rather than on correcting the strucutural factors that have led to or contributed to the "state of affairs" seems, therefore, to be self-serving and completely unproductive. • The worst part of the IQ line of thought is that people actually would like to base policy on some statistical studies involving IQ. I agree with all these statements, most of all with your provision about the "black–inferior" thing: having a lower IQ should never be considered an "inferiority", regardless of skin color. Yet IQ differences do exist, and the confusion with "class" often arises as soon as we try to measure it or other things ( S.J.Gould's book is a good example). Maybe this is due to our tendancy to think in terms of "good" and "bad" or in terms of a vertical rather than horizontal scale. So to the question asked above, "What should we do about IQ? ", I answer "Nothing, just let it be". What I mean by that is that public policies should not be concerned with people's IQ. Also, they should not try to change IQ as they have sometimes been trying to, all the more since we don't even know how to do it. From my liberal perspective, each individual should be considered responsible for making what he/she wishes of his life with no external interference every time it is possible. Those who are physically or mentally unable need to be helped, but the rest of us can each try his own way. We will be sometimes lucky, sometimes not, but this is also part of the thrill! • Well... I'm not sure if it's 'your' theory, but even if it were, it can be debunked just as well. Who says taller men get married earlier? And what does this mean in terms of procreating taller children? So my question is, why are these people getting taller and why are taller men so much more desirable that average but intellectually successful men? As you can guess, I would be delighted to find some scholar supporting the idea. At first, I was sure I had read about this theory it somewhere. I remain convinced that someone must have come up with this idea before me, but I have found no evidence on Internet yet. So how could this work? Very simply: women prefer taller men (for no good reason, but as a state of facts), and the rest follows. The evidence to support this outrageous idea is given by the INSEE statistics, which show beyond doubt that in France taller men get married earlier, more often, and have more children. All of those contribute to the faster replication of their genes. I don't know if you will share my feeling, but this makes me absolutely hilarious and rather glad to be so brought back to my condition of "thinking animal". Afin de lutter contre les problèmes de logement, Villepin vient d'annoncer la création d'un fonds garantie locative pour les personnes modestes. En caricaturant, on pourra donc louer un appartement sans payer son loyer (garantie locative gratuite) et sans pouvoir être expulsé (protection des locataires). Non, on ne compte pas plus d'escrocs chez les locataires que chez les propriétaires. Mais "les gens réagissent aux incitation" et ici l'incitation devient tellement forte que l'on peut s'attendre à ce que le nombre de locataires qui y succombent augmente. Ce n'est pas vraiment ce qu'on appelle une bonne incitation économique. Simultanément, Villepin annonce un crédit d'impôt pour l'emploi d'un salarié à domicile. Jusqu'à présent les ménages non imposables ne pouvaient pas bénéficier de cette aide. Ceci créait une distorsion des incitations : les ménages aisés étaient plus incités que les ménages modestes à travailler et à prendre une nounou. Cette mesure est nettement meilleure que la précédente car elle supprime une distorsion des prix. Mais il ne faut pas perdre de vue que c'est une subvention des emplois peu qualifiés, équivalente aux allégements de charge sur le SMIC. Si nous avons besoin de ces allègements, c'est d'abord parce que notre SMIC est très élevé (entre 1700 et 1800 euros par mois charges comprises) et détruit des emplois. - pour taxer une activité il peut soit augmenter l'impôt pour la catégorie concernée, soit le baisser pour toutes les autres. Grâce à cette flexibilité, l'Etat peut agir sur les incitations "à la marge" dans la plupart des activités économiques avec un faible coût budgétaire. En apparence, la dépense publique est "limitée" (sic) à 55% du PIB. Mais en réalité, la sphère d'influence de l'Etat sur l'activité économique s'étend bien au-dela. des chats que l'on appelait "tortues"
Je me souviendrai de "Bon voyage"
Nous allons prendre soin de Mamy et Cécile. L’Université de tous les savoirs organise en ce moment des disputes – ou disputations – sur une série de thèmes. Celle du 19 octobre dernier réunissait face à face Alain Madelin et Thomas Piketty sur la question de l’impôt et de la pression fiscale. Leur débat offre un tour d’horizon complet, présenté par deux débatteurs qui connaissent bien le sujet, et ont des vues presque diamétralement opposées. Si vous avez le temps, je recommande d'écouter leur débat, sinon en voici un résumé. La question de l’impôt et de la pression fiscale n’est pas une question technique, mais une question avant tout politique. Une baisse de 10 à 15% des prélèvements obligatoires est improbable en raison de l’allongement de la durée de la vie et des dépenses de santé. Une forte hausse l’est tout autant parce que la croissance actuelle est faible, et que dans un tel scénario le pouvoir d’achat disponible après prélèvements stagnerait. Raisonnablement, il faut donc s’attendre à ce que le niveau global de pression fiscale reste autour de son niveau actuel à 45%, voire augmente très légèrement. Si des baisses sont possibles, il est important d’identifier les prélèvements qui ont le plus d’effets négatifs, et de cibler en priorité ces derniers. Ainsi, l’impôt sur le revenu français ne représente que 3% de PIB contre 8 à 10% dans la plupart des pays européens. Ce n’est pas l’impôt qu’il faut réduire en priorité, et mieux vaudrait concentrer les baisses sur les charges sociales qui pénalisent le travail. Il y a un problème de répartition et d’opacité, une accumulation invraisemblable d’impots, de charges et de taxes locales. Qui paie quoi pour quoi ? Il faudrait distinguer le financement des dépenses publiques directements administrées par l’Etat, des assurances obligatoires pour les personnes – retraites et chômage – qui représentent entre 15 et 20% de PIB. La retraite par répartition a été instaurée en France pour une bonne raison, parce que les épargnants avaient vu leurs économies fondre à la suite des chocs des guerres mondiales et des années 1930. Les marchés financiers avaient été incapables de transférer des revenus dans le temps de manière certaine sur une période de 30 ans. A contrario, la retraite par répartition permet de garantir un certain taux de remplacement du salaire. Les dépenses maladie et famille relèvent d’une logique de solidarité nationale, indépendamment des cotisations payées par les uns et les autres. 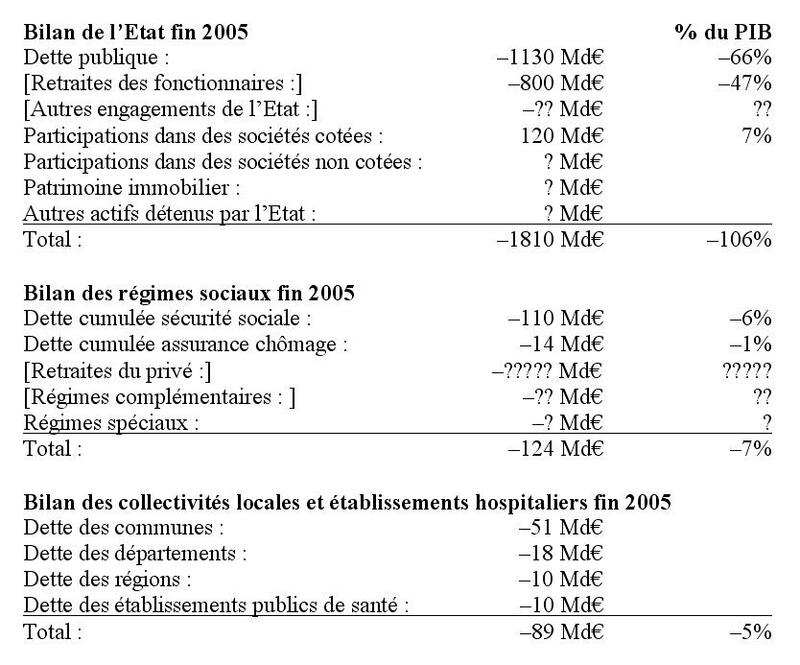 Cette distinction entre différents types de dépenses [NDR : services publics, revenus différés, solidarité nationale] est compliquée pour les citoyens car on utilise le même type d’impôts pour les financer. En particulier, les dépenses qui relèvent de la solidarité devraient être financées par un impôt sur toutes les formes de richesses et pas seulement sur les salaires. Un exemple de prélèvement qui mériterait d’être réduit est celui des régimes de retraites complémentaires obligatoires. Pour les cadres, ce régime va jusqu’à 8 fois le plafond de la Sécu, soit environ 15 SMIC. Cela ne rapporte rien en termes de redistribution parce que ces personnes ont une espérance de vie supérieure à la moyenne, et de plus ne souhaitent pas nécessairement cotiser pour leur retraite à un tel niveau. Ce prélèvement est donc mal perçu par les cotisants concernés, et n’apporte rien aux autres. Il n’en existe pas d’équivalent dans les autres pays, où le plafond est généralement beaucoup plus bas. La vraie question est donc : quels impôts pour quelles dépenses, plutôt que : faut-il baisser ou augmenter la pression fiscale ? Il faut alléger la pression fiscale, c’est-à-dire le total impôts plus cotisations sociales plus endettement – car ce sont des prélèvements obligatoires différés. Depuis F.Mitterand, le niveau de 45% est resté stable, mais dans le même temps l’endettement a explosé. C’est le total qui représente la dépense publique, soit 54 ou 55%. Diminuer la pression fiscale, c’est diminuer le pourcentage des dépenses publiques dans la dépense nationale. Ceci peut se faire avec une croissance forte en stabilisant les dépenses en volume. La dépense publique trace une frontière entre l’économie marchande concurrentielle où le consommateur commande et le domaine public qui échappe à la concurrence et où c’est le politique qui commande. Les règles d’efficacité ne sont pas les mêmes dans ces deux secteurs. Comme notre machine à produire des biens et des emplois marchands est trop petite, cela freine la croissance, crée du chômage et de la pauvreté, d’où des dépenses publiques supplémentaires, et un cercle vicieux s’installe. En Suède, le taux de prélèvement obligatoires est élevé, mais leurs services publics sont ouverts à la concurrence et sont plus largement consacrés à préparer l’avenir. 1) Notre pression fiscale est trop forte aux deux extrêmes de l’échelle de revenus. La pression fiscale marginale modifie les incitations à travailler ou à innover. Ce lien est établi, comme le montre notre pratique des dérogations et incitations fiscales diverses. En bas de l’échelle, le coût du travail est excessif, alourdi par le SMIC et les 35 heures, ce qui fait que certains emplois coûtent plus cher qu’ils ne rapportent, et donc ils ne voient pas le jour ou nourrissent le travail au noir. Dans de nombreux cas, la sortie du système d’aides sociales pour reprendre un travail n’apporte qu’un fain très faible : c’est la fameuse « trappe à pauvreté ». Pour augmenter l’incitation marginale à reprendre un travail, le gouvernement Jospin a créé la Prime pour l’emploi, une bonne idée qui a été mal exécutée est qui est dénoncée dans un rapport de la Cour des Comptes. En haut de l’échelle de revenus, nous avons une pression marginale qui est sans doute un record au Monde. Tout se passe comme si nous surtaxions notre matière grise. Celle-ci est attenuée par un autre record : toutes nos exonérations et diverses niches fiscales. 2) Notre niveau actuel de dépenses et de prélèvements publics est insoutenable. Nous sommes dans un monde ouvert, où les états sont en concurrence pour savoir celui qui organisera le meilleur rapport qualité-prix des services publics qu’il fournit. L’endettement n’est pas condamnable s’il reste dans les limites de notre capacité de remboursement et s’il correspond à la préparation du futur : ce n’est pas le cas. Notre dépense publique a longtemps été indolore, financée par la planche à billets et l’impôt d’inflation, puis plus douloureuse avec la montée des prélèvements obligatoires. Elle est aujourd’hui moins douloureuse parce que reportée sur les générations futures. 3) La pression fiscale est le reflet de choix politiques. Le choix sous-jacent à notre excès de dépenses publiques est l’héritage d’un rêve socialiste, dans lequel les consommations collectives devraient l’emporter sur les choix individuels, et l’Etat se voit accorder un rôle tutélaire. La frontière entre dépenses collectives et individuelles est un choix de société qui est variable selon les époques : téléphone, télévision. Pour des raisons politiques et éthiques, je donne la préférence chaque fois que c’est possible à la liberté de choix, n’ayant recours à la consommation collective que quand c’est vraiment nécessaire. Notre pression fiscale est aussi légimitée par la lutte contre les inégalités. Pourtant, il semble aujourd’hui qu’avec notre conception de la justice distributive, la justice sociale soit en panne avec un nombre croissant de RMIstes et de bénéficiaires de la CMU et des minima sociaux. Il existe une autre conception de la justice sociale. Imaginons qu’il existe une loterie qui tire au sort la situation sociale dans laquelle chacun peut naître. On cherche alors à concevoir les meilleurs institutions possibles, en se disant que l’on pourrait aussi tirer un mauvais numéro. Cette conception développée par John Rawls est une bonne approche. Elle permet d’accepter des inégalités fécondes, génératrices d’incitations à entreprendre et donc de croissance. Une croissance de 3,5% c’est le doublement du pouvoir d’achat en 20 ans. Quelle politique de redistribution peut permettre à quelqu’un d’atteindre un tel résultat ? - la remise à plat de notre système fiscal et social – et non des mesures en trompe-l’œil comme les transferts ou la TVA sociale pour faire payer les produits étrangers. - Clarifier et distinguer ce qui relève de la solidarité nationale de ce qui relève de l’assurance obligatoire. Une différence avec T.Piketty : l’assurance maladie s’appelle « assurance », alors que les allocations familiales c’est la solidarité – c’est l’impôt – car on ne s’assure pas contre le risque d’avoir des enfants. - Supprimer la fiction des cotisations patronales [NDR : çàd les fusionner avec les charges salariales] car elles font partie du coût du travail et constituent un salaire différé pour le salarié. - Transformer toutes nos exonérations de charges sociales en une franchise, par exemple sur les 500 premiers euros. - Intégrer la CSG à l’impôt sur le revenu comme une première tranche payée par tous les Français, et limiter la tranche supérieure à peut-être 33% en contrepartie de suppression de la très grande partie de nos 418 niches fiscales dont le coût est de 50 millards d’euros, et enfin prélever l’impôt à la source. - Instaurer un revenu familial garanti inspiré de l’impôt négatif. - Donner à nos entreprises une fiscalité compétitive par rapport à nos partenaires. - Réformer la fiscalité de l’épargne qui subit des impôts en cascade : droits de succession, impôts sur les plus-values, droits de mutation, ISF, afin d’assurer une neutralité fiscale entre les différentes formes de placements. La presse se fait aujourd’hui l’écho de la situation des retraites des anciens salariés de la SNCF. A l’occasion du passage aux normes comptables IFRS, l’entreprise publique est priée par ses auditeurs de passer en 2006 une provision de 8 Md€ (milliards d’euros) alors que ses fonds propres ne sont que de 4,8 Md€. Les comptes seront clos aux 31 décembre, et doivent être arrêtés par le Conseil d’Administration puis approuvés en AG avant le 30 juin 2007, ce qui laisse quelques mois à l’Etat pour trouver une solution avec la SNCF. Qu’est-ce que cela signifie ? La SNCF fait partie des entreprises dont les salariés bénéficient d’un régime spécial de retraites. Elle paie elle-même les pensions de ses anciens salariés (enfin presque…), ce qui pose un problème lorsque les effectifs décroissent : les salariés actifs sont de moins en moins nombreux pour payer les pensions de retraités de plus en plus nombreux. Cela n’a rien d’original, puisque c’est la situation du régime général des retraites de la sécurité sociale. Mais à la SNCF l’effet démographique est nettement plus fort, puisqu’elle compte aujourd’hui 310 000 retraités pour 170 000 actifs. C’est pourquoi, en réalité, la SNCF ne parvient déjà plus à payer les retraites de ses salariés : en 2005, les cheminots retraités ont reçu 4,7 milliards d'euros, dont 1,8 milliard versés par la SNCF et 2,6 milliards par l'État. Comment est calculé le montant de la provision ? Ces 8 Md€ correspondent à des avantages supplémentaires accordés par la SNCF à ses retraités en 1990. Elle a, entre autres, intégré des primes dans le calcul des pensions. Les engagements au titre des retraites des cheminots représentent entre 105 et 108 milliards d'euros qui devront être versés sur cinquante à soixante ans. Soit, grosso modo, 2 milliards d'euros par an [NB: ce calcul de journaliste est faux car il faudrait actualiser les paiements annuels, mais même si on divise par deux les 108 Md€, la conclusion n'est pas vraiment modifiée]. Que trouve-t-on dans les comptes de la SNCF pour refléter cet engagement ? Comme on le voit, le montant estimé de l'engagement hors bilan des retraites ne couvre que deux ans de pension avec la part versée par l’Etat. Il y a une raison qui permettait de comptabiliser un montant aussi faible. La SNCF a encore des salariés qui paient des cotisations couvrant une bonne partie des 2 Md€ qu’elle doit verser chaque année à ses retraités. Je suppose - mais n'ai pas vérifié - que le montant de l'engagement hors bilan ci-dessus ne correspond qu’à la différence entre les deux. L’intégration des primes en 1990 a augmenté les pensions, d’où la provision supplémentaire de 8 Md€. Cependant, le véritable engagement de la SNCF vis-à-vis de ses retraités est beaucoup plus important. Si elle avait constitué un fonds pour payer leurs pensions, comme l’ont fait General Motors ou Ford (avec les difficultés que l’on sait), ce fonds serait d’un montant de l’ordre de 100 Md€ d’après les chiffres cités plus haut. La provision de la SNCF qui fait tant parler d’elle n’est en réalité que la partie émergée d’un iceberg qui est fondamentalement le même pour tous les régimes par répartition. On peut accepter qu'un système de répartition génère des déficits dans une période où le nombre d'actifs par retraité diminue. Mais, dans ce cas, il faut exiger qu'il génère des excédents dans les périodes où le nombre d'actifs est en croissance. Or cette période de croissance a existé à la SNCF, mais à l'époque les excédents de cotisations des cheminots n'ont pas été transférés au régime général. - ou bien protester pour avoir une part plus importante du gâteau, en justifiant cette demande par les spécificités de son statut. La première option consiste à travailler pour accumuler le plus possible de « points » de cotisation retraite. La deuxième consiste à essayer d’acheter ses points le moins cher possible, et à les liquider le plus tôt et le plus cher possible, par tous les moyens politiques et syndicaux possibles, et ce au détriment des autres salariés. Le comportement des Français est donc un mélange des deux, et la deuxième option est ressentie de plus en plus durement par ceux qui en font les frais. Les régimes spéciaux tels que celui de la SNCF comprennent des catégories de salariés qui ont poussé la deuxième stratégie le plus loin. Mais leur cas n'est pas unique, car même le régime général incite les représentants des salariés à opter pour cette stratégie chaque fois qu'ils en ont la possibilité. Malgré ces défauts, l’évolution la plus probable des régimes spéciaux restants (SNCF, RATP, La Poste) est toute tracée : l’intégration dans le régime général. Pour la SNCF, les 2 Md€ qu’elle verse annuellement à ses retraités seraient donc versées à la Sécurité Sociale comme dans n’importe quelle entreprise dont les salariés cotisent. En contrepartie, la Sécurité Sociale reprendrait vraisemblablement à sa charge la part des pensions qui est actuellement supportée par la SNCF – mais pas la part de l’Etat. Pourtant, cela ne suffit pas, car le nombre de salariés de la SNCF va encore décroître et le nombre de ses retraités augmenter, et ce plus vite que dans la population générale. La Sécurité Sociale se retrouverait donc aux termes de cet échange avec des charges croissantes et un revenu décroissant. Pour compenser cette évolution démographique, une soulte serait demandée à la SNCF, comme cela a été le cas pour France Telecom, EDF et GDF. En conclusion, voici une synthèse de quelques chiffres concernant la SNCF. Il en ressort que les sommes en jeu pour les retraites sont très importantes par rapport à la taille de l’entreprise : on a vu que la provision dépassait les fonds propres, mais il est plus parlant d’imaginer que la soulte représenterait plus d’un an de chiffre d’affaires, et que le total des pensions de retraites versées (SNCF et Etat confondus) représentait un quart du chiffres d’affaires en 2005. Enfin, les engagements au titre des retraites sont plus importants que le coût de l'infrastructure, d'un facteur quatre si on raisonne comme un fonds de pension. Compte-tenu de la séparation du réseau confié à Réseau Ferré de France et de l’exploitant qui est la SNCF, il est utile d’examiner les chiffres de RFF pour comprendre les flux entre les deux entités. RFF présente un résultat d’exploitation tout juste équilibré, et encore grâce à 1 Md€ par an au titre de la « contribution de l’Etat de aux charges d’infrastructure », et un résultat financier de –0,5 Md€ malgré une « contribution au désendettement » de 0,8 Md€ par an. 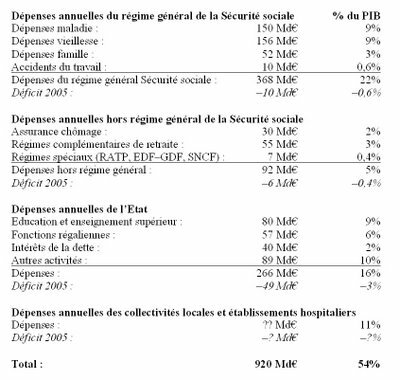 En additionnant ces chiffres, on aboutit à la conclusion que la contribution totale de l’Etat à RFF est supérieure à 2 Md€ par an. C’est-à-dire que la SNCF, pour autant que je comprenne les chiffres de RFF, s’occupe de l’entretien du réseau mais ne paie en réalité ni l’amortissement des investissements ni les frais financiers correspondants. En d’autres termes, il semble que les billets des voyageurs paient environ la moitié du coût total des voies ferrées, mais que l’autre moitié sera remboursée entièrement et exclusivement par l’impôt. Depuis une semaine, j’héberge un couple d’amis américains dont la femme cherche un petit studio à Paris le temps de faire avancer ses recherches doctorales. Ils pensaient trouver rapidement, et partir ensuite quelques jours en Champagne avant que le mari ne rentre aux Etats-Unis, mais ils ont vite déchanté. 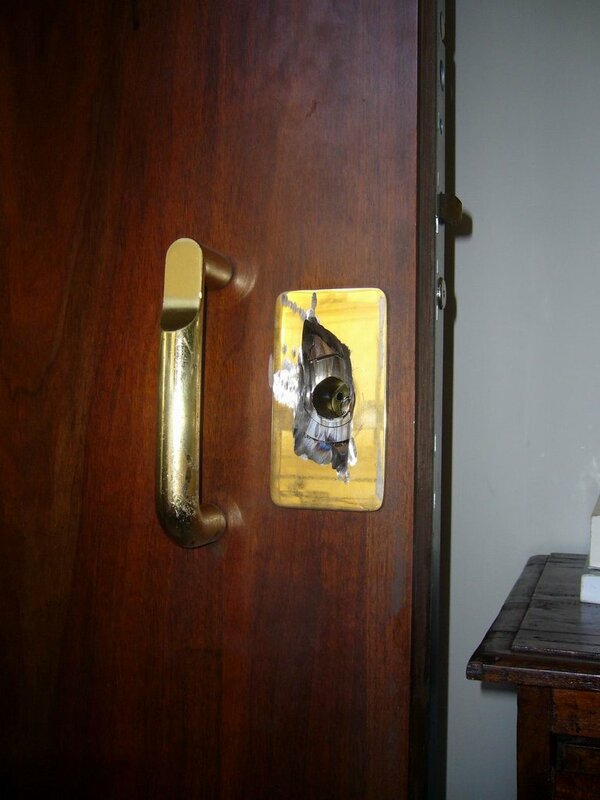 Après les premiers appels téléphoniques, ils n’avaient obtenu que très peu de rendez-vous, et encore pour des studios dont le loyer était au-dessus de leur budget. Après huit jours de recherches, leur conclusion est qu’il existe une offre significative à partir de 700€ par mois, mais très peu de choses en-dessous de 600€. Le clou a été la visite d’un 13m² coincé entre une cave et un rez-de-chaussée, avec un soupirail pour toute ouverture, humide et mal entretenu, dont le propriétaire demandait 250€… la semaine ! A peu près au même moment, les médias annonçaient un rapport dans lequel la Haute Autorité de Santé préconise de dérembourser de nombreux médicaments. Leur efficacité étant jugée insuffisante, le Ministre de la Santé, à qui reviendra la décision finale, pourrait donc réduire le taux de prise en charge de ces médicaments par la Sécurité Sociale. Les journalistes ajoutaient que, dans des cas similaires, le prix des médicaments déremboursés avait parfois augmenté. Quel est le lien entre les studios et les médicaments ? Dans les deux cas, il s’agit de produits dont le prix est subventionné. Comme on va le voir plus loin, l’existence d’une subvention semble faire monter les prix des petits studios, tandis que dans le cas des médicaments, c’est la suppression de la subvention qui fait monter les prix. C’est cette apparente contradiction qui m’a fait dresser l’oreille et hausser le sourcil. Voyons ce qu’il en est. La cible privilégiée des loueurs de petites surfaces sont par exemple les étudiants ou personnes seules ayant un faible revenu, qui peuvent bénéficier de diverses aides au logement. La plus connue est l’Aide Personalisée au Logement, qui représente généralement entre 80 et 230€ par mois. 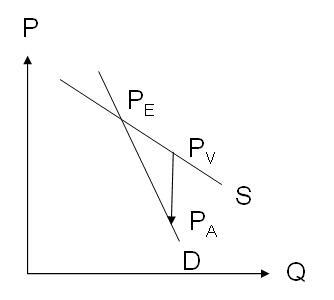 La théorie économique permet-elle de prédire l’effet de ces subventions sur les loyers des petites surfaces ? Selon la loi de l’offre et de la demande, la subvention agit comme un décalage de la courbe d’offre vers des prix (P) afin d’offrir des prix plus bas au locataire. La demande des locataires peut donc être servie pour une quantité (Q) plus importante que leur pouvoir d’achat ne le permettrait sans subvention. On peut noter qu’une taxe agit exactement en sens inverse, ou si l’on préfère, comme une subvention négative. 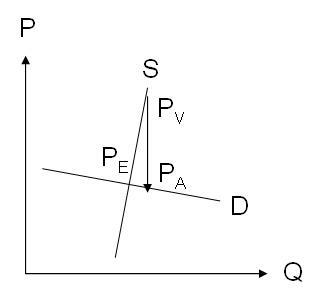 La courbe de demande (D) a une pente décroissante avec la quantité, c’est-à-dire que les prix doivent baisser si l’on veut que les acheteurs achètent plus. Pour la courbe d’offre (S comme supply) c’est l’inverse, les producteurs ayant tendance à augmenter les quantités produites lorsque les prix montent. Les deux courbes se coupent donc en un point, lequel détermine le prix du marché, noté PE comme prix d’équilibre. La subvention peut donc être représentée comme une flèche qui va de la courbe d’offre vers la courbe de demande. 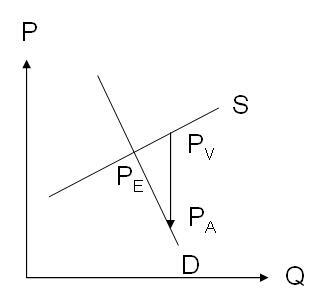 Le point de départ correspond au prix perçu par le vendeur, noté PV, et la pointe de la flèche correspond au prix payé par l’acheteur après déduction de la subvention, et on le note PA. Le prix acheteur est inférieur au prix vendeur, du montant de la subvention. On note au passage que la quantité produite et consommée augmente lorsqu’on met en place la subvention. La question qui se pose immédiatement et de savoir si la subvention « ira dans la poche du propriétaire », ou bénéficiera comme prévu au locataire. Cela dépend des pentes respectives des deux courbes. Sur le premier graphique ci-dessus, la courbe d’offre est très raide, ce qui signifie que la quantité produite ou disponible augmente peu lorsque les prix montent. A l’inverse, la courbe de demande est presque plate, et les acheteurs n’ont qu’un budget pratiquement constant à consacrer à ce produit. Sur le deuxième graphique ci-dessous figure au contraire un exemple où l’offre augmente rapidement avec les prix, tandis que les acheteurs veulent consommer une quantité pratiquement fixe indépendamment du prix. - La quantité d’appartements à Paris est limitée, donc l’offre est a priori peu sensible au prix ; les acheteurs ont un budget limité car ils consacrent généralement une part importante de leur revenu à se loger et ne peuvent pas l’augmenter beaucoup ; on devrait se situer dans le cas du premier graphique. - La quantité de médicaments produite est très variable, et les coûts de production sont faibles par rapport aux coûts fixes de recherche et de marketing ; les patients ont besoin de ces médicaments lorsqu’ils sont malades, et peuvent dégager le budget qu’il faut pour les acheter en quantité suffisante ; cela correspond plutôt au second graphique. Ceci étant exposé, la théorie économique voudrait donc que le prix des logements – en particulier des petites surfaces – augmente du fait des subventions. Sur le premier graphique, le prix vendeur est nettement plus élevé que le prix d’équilibre sans subvention, et le prix acheteur baisse peu. En caricaturant, on peut donc dire que « la subvention tombe dans la poche du propriétaire ». C’est ce que les études dans ce domaine semblent confirmer. En ce qui concerne les médicaments, en revanche, on n’observe pas que la subvention fait baisser les prix. C’est pourquoi j'ai été surpris par la remarque du journaliste qui disait que lorsqu’on déremboursait les médicaments, certains prix montaient, ce qui m'a incité à écrire cet article. Sur le second graphique, en effet, il semble que le prix vendeur augmente un peu grâce à la subvention. Comment sa suppression pourrait-elle faire monter ce prix ? Ce serait oublier que le marché d’un médicament n’est pas un marché concurrentiel parfait. Pour les médicaments relativement récents, protégés par des brevets, le fabricant dispose d’un monopole au moins jusqu’à l’expiration de ses brevets. Dans un marché concurrentiel, la courbe d’offre normale est déterminée par une myriade de petits producteurs dont aucun n’est assez gros pour modifier le prix de marché. C’est le cas des producteurs de pommes de terre par exemple. Mais pour les médicaments, le fabricant qui dispose d’un monopole peut modifier la courbe d’offre car c’est SA courbe à lui. La conséquence est qu’elle change radicalement d’allure. Si les quantités diminuent, le fabricant est incité à augmenter ses prix pour maintenir ses bénéfices. A l’inverse, il peut décider de baisser ses prix si il estime que cette perte sera plus que compensée par l’augmentation des ventes qui en résultera. La pente de la courbe d’offre devient donc négative. Le troisième graphique montre ce qui se passe dans ce cas : la suppression de la subvention fait passer du prix PV à un prix d’équilibre PE qui est plus élevé malgré que la quantité a baissé. Ainsi, on comprend maintenant qu’une subvention peut faire baisser le prix des médicaments, tandis qu’elle fait monter les loyers. L’explication est plausible. Encore faudrait-il vérifier si cette interprétation reflète bien la réalité des marchés immobilier et de la santé, ou si ce n’est qu’un modèle ad’hoc. Enfin, chacun pourra se faire sa propre opinion sur la légitimité des subventions, au regard des explications qui précèdent. Suite à un précédent post, voici les résultats de mon analyse ADN réalisée par le Genographic Project. De nombreuses personnes en Europe appartiennent à ce haplogroupe. 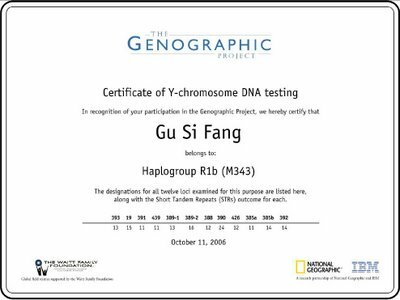 Your Y-chromosome results identify you as a member of haplogroup R1b. The genetic markers that define your ancestral history reach back roughly 60,000 years to the first common marker of all non-African men, M168, and follow your lineage to present day, ending with M343, the defining marker of haplogroup R1b. Today, roughly 70 percent of the men in southern England belong to haplogroup R1b. In parts of Spain and Ireland, that number exceeds 90 percent. What's a haplogroup, and why do geneticists concentrate on the Y chromosome in their search for markers? For that matter, what's a marker? Each of us carries DNA that is a combination of genes passed from both our mother and father, giving us traits that range from eye color and height to athleticism and disease susceptibility. One exception is the Y chromosome, which is passed directly from father to son, unchanged, from generation to generation. Unchanged, that is unless a mutation a random, naturally occurring, usually harmless change occurs. The mutation, known as a marker, acts as a beacon: it can be mapped through generations because it will be passed down from the man in whom it occurred to his sons, their sons, and every male in his family for thousands of years. In some instances there may be more than one mutational event that defines a particular branch on the tree. 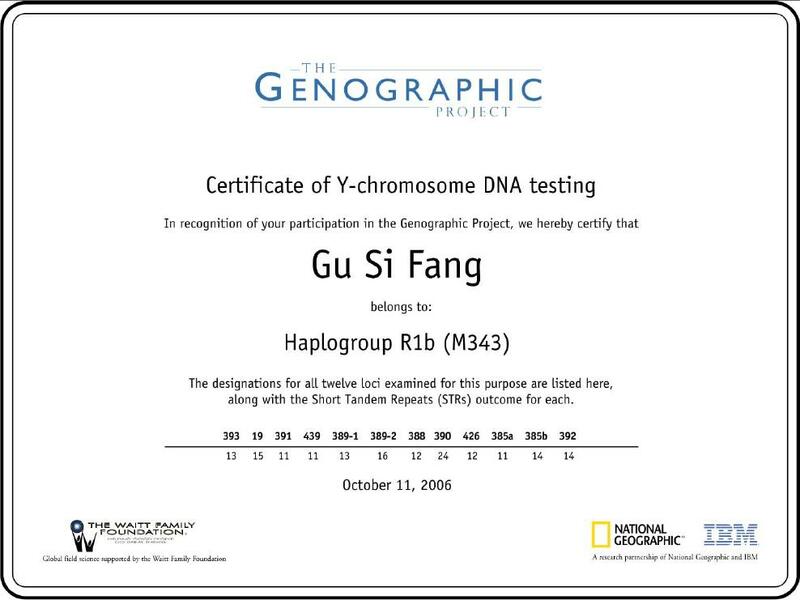 This means that any of these markers can be used to determine your particular haplogroup, since every individual who has one of these markers also has the others. When geneticists identify such a marker, they try to figure out when it first occurred, and in which geographic region of the world. Each marker is essentially the beginning of a new lineage on the family tree of the human race. Tracking the lineages provides a picture of how small tribes of modern humans in Africa tens of thousands of years ago diversified and spread to populate the world. A haplogroup is defined by a series of markers that are shared by other men who carry the same random mutations. The markers trace the path your ancestors took as they moved out of Africa. Ifs difficult to know how many men worldwide belong to any particular haplogroup, or even how many haplogroups there are, because scientists simply don't have enough data yet. One of the goals of the five-year Genographic Project is to build a large enough database of anthropological genetic data to answer some of these questions. To achieve this, project team members are travelling to all corners of the world to collect more than 100,000 DNA samples from indigenous populations. In addition, we encourage you to contribute your anonymous results. Skeletal and archaeological evidence suggest that anatomically modern humans evolved in Africa around 200,000 years ago, and began moving out of Africa to colonize the rest of the world around 60,000 years ago. The man who gave rise to the first genetic marker in your lineage probably lived in northeast Africa in the region of the Rift Valley, perhaps in present-day Ethiopia, Kenya, or Tanzania, some 31,000 to 79,000 years ago. Scientists put the most likely date for when he lived at around 50,000 years ago. His descendants became the only lineage to survive outside of Africa, making him the common ancestor of every non-African man living today. But why would man have first ventured out of the familiar African hunting grounds and into unexplored lands? It is likely that a fluctuation in climate may have provided the impetus for your ancestors' exodus out of Africa. The African ice age was characterized by drought rather than by cold. It was around 50,000 years ago that the ice sheets of northern Europe began to melt, introducing a period of warmer temperatures and moister climate in Africa. Park of the inhospitable Sahara briefly became habitable. As the drought-ridden desert changed to a savannah, the animals hunted by your ancestors expanded their range and began moving through the newly emerging green corridor of grasslands. Your nomadic ancestors followed the good weather and the animals they hunted, although the exact route they followed remains to be determined. In addition to a favorable change in climate, around this same time there was a great leap forward in modern humans' intellectual capacity. Many scientists believe that the emergence of language gave us a huge advantage over other early human species. Improved tools and weapons, the ability to plan ahead and cooperate with one another, and an increased capacity to exploit resources in ways we hadn't been able to earlier, all allowed modern humans to rapidly migrate to new territories, exploit new resources, and replace other hominids. The next male ancestor in your ancestral lineage is the man who gave rise to M89, a marker found in 90 to 95 percent of all non-Africans. This man was born around 45,000 years ago in northern Africa or the Middle East. The first people to Leave Africa likely followed a coastal route that eventually ended in Australia. Your ancestors followed the expanding grasslands and plentiful game to the Middle East and beyond, and were part of the second great wave of migration out of Africa. Beginning about 40,000 years ago, the climate shifted once again and became colder and more arid. Drought hit Africa and the grasslands reverted to desert, and for the next 20,000 years, the Saharan Gateway was effectively closed. With the desert impassable, your ancestors had two options: remain in the Middle East, or move on. Retreat back to the home continent was not an option. While many of the descendants of M89 remained in the Middle East, others continued to follow the great herds of buffalo, antelope, woolly mammoths, and other game through what is now modern-day Iran to the vast steppes of Central Asia. These semiarid grass-covered plains formed an ancient "superhighway" stretching from eastern France to Korea. Your ancestors, having migrated north out of Africa into the Middle East, then traveled both east and west along this Central Asian superhighway. A smaller group continued moving north from the Middle East to Anatolia and the Balkans, trading familiar grasslands for forests and high country. Your next ancestor, a man born around 40,000 years ago in Iran or southern Central Asia, gave rise to a genetic marker known as M9, which marked a new Lineage diverging from the M89 Middle Eastern Clan. His descendants, of which you are one, spent the next 30,000 years populating much of the planet. This large Lineage, known as the Eurasian Clan, dispersed gradually over thousands of years. Seasoned hunters followed the herds ever eastward, along the vast super highway of Eurasian steppe. Eventually their path was blocked by the massive mountain ranges of south Central Asia the Hindu Kush, the Tian Shan, and the Himalayas. The three mountain ranges meet in a region known as the "Pamir Knot," located in present-day Tajikistan. Here the tribes of hunters split into two groups. Some moved north into Central Asia, others moved south into what is now Pakistan and the Indian subcontinent. These different migration routes through the Pamir Knot region gave rise to separate lineages. Most people native to the Northern Hemisphere trace their roots to the Eurasian Clan. Nearly all North Americans and East Asians are descended from the man described above, as are most Europeans and many Indians. 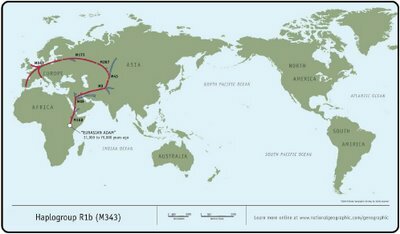 The next marker of your genetic heritage, M45, arose around 35,000 years ago, in a man born in Central Asia. He was part of the M9 Eurasian Clan that had moved to the north of the mountainous Hindu Kush and onto the game-rich steppes of present day Kazakhstan, Uzbekistan, and southern Siberia. Although big game was plentiful, the environment on the Eurasian steppes became increasing hostile as the glaciers of the Ice Age began to expand once again. The reduction in rainfall may have induced desertlike conditions on the southern steppes, forcing your ancestors to follow the herds of game north. To exist in such harsh conditions, they learned to build portable animal-skin shelters and to create weaponry and hunting techniques that would prove successful against the much larger animals they encountered in the colder climates. They compensated for the lack of stone they traditionally used to make weapons by developing smaller points and blades microliths that could be mounted to bone or wood handles and used effectively. Their tool kit also included bone needles for sewing animal-skin clothing that would both keep them warm and allow them the range of movement needed to hunt the reindeer and mammoth that kept them fed. Your ancestors' resourcefulness and ability to adapt was critical to survival during the last ice age in Siberia, a region where no other hominid species is known to have lived. The M45 Central Asian Clan gave rise to many more; the man who was its source is the common ancestor of most Europeans and nearly all Native American men. After spending considerable time in Central Asia, refining skills to survive in harsh new conditions and exploit new resources, a group from the Central Asian Clan began to head west towards the European subcontinent. An individual in this clan carried the new M207 mutation on his Y chromosome. His descendants ultimately split into two distinct groups, with one continuing onto the European subcontinent, and the other group turning south and eventually making it as far as India. Your lineage falls within the first haplogroup, R1, and gave rise to the first modern humans to move into Europe and eventually colonize the continent. As your ancestors continued to move west, a man born around 30,000 years ago in Central Asia gave rise to a lineage defined by the genetic marker M173. His descendants were part of the first large wave of humans to reach Europe. During this period, the Eurasian steppe lands extended from present-day Germany, and possibly France, to Korea and China. The climate fostered a land rich in resources and opened a window into Europe. Your ancestors' arrival in Europe heralded the end of the era of the Neandertals, a hominid species that inhabited Europe and parts of western Asia from about 29,000 to 230,000 years ago. Better communication skills, weapons, and resourcefulness probably enabled your ancestors to out compete Neandertals for scarce resources. This wave of migration into Western Europe marked the appearance and spread of what archaeologists call the Aurignacian culture. The culture is distinguished by significant innovations in methods of manufacturing tools, more standardization of tools, and a broader set of tool types, such as end-scrapers for preparing animal skins and tools for woodworking. In addition to stone, the first modern humans to reach Europe used bone, ivory, antler, and shells as part of their tool kit. Bracelets and pendants made of shells, teeth, ivory, and cawed bone appear at many sites. Jewelry, often an indication of status, suggests a more complex social organization was beginning to develop. The large number of archaeological sites found in Europe from around 30,000 years ago indicates that there was an increase in population size. Around 20,000 years ago, the climate window shut again, and expanding ice sheets forced your ancestors to move south to Spain, Italy, and the Balkans. As the ice retreated and temperatures became warmer, beginning about 12,000 years ago, many descendants of M173 moved north again to repopulate places that had become inhospitable during the Ice Age. Not surprisingly, today the number of descendants of the man who gave rise to marker M173 remains very high in Western Europe. It is particularly concentrated in northern France and the British Isles where it was carried by ancestors who had weathered the Ice Age in Spain. Around 30,000 years ago, a descendant of the clan making its way into Europe gave rise to marker M343, the defining marker of your haplogroup. You are a direct descendent of the people who dominated the human expansion into Europe, the Cro-Magnon. The Cro-Magnon are responsible for the famous cave paintings found in southern France. These spectacular paintings provide archaeological evidence that there was a sudden blossoming of artistic skills as your ancestors moved into Europe. Prior to this, artistic endeavors were mostly comprised of jewelry made of shell, bone, and ivory; primitive musical instruments; and stone carvings. The cave paintings of the Cro-Magnon depict animals like bison, deer, rhinoceroses, and horses, and natural events important to Paleolithic life such as spring molting, hunting, and pregnancy. The paintings are far more intricate, detailed, and colorful than anything seen prior to this period. Your ancestors knew how to make woven clothing using the natural fibers of plants, and had relatively advanced tools of stone, bone, and ivory. Their jewelry, carvings, and intricate, colorful cave paintings bear witness to the Cro-Magnons' advanced culture during the last glacial age. This is where your genetic trail, as we know it today, ends. However, be sure to revisit these pages. As additional data are collected and analyzed, more will be Learned about your place in the histoly of the men and women who first populated the Earth. We will be updating these stories throughout the life of the project. 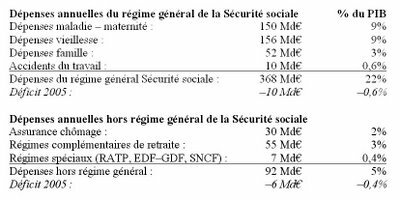 3% de déficit budgétaire, 1000 ou 2000 milliards de dette, le trou de la Sécurité sociale : pris séparément ces chiffres ne me disaient pas grand-chose. J’ai voulu comprendre la signification de ce qu’on appelle le modèle social français, et pourquoi il avait mis nos finances dans cet état. Je tente de présenter dans cet article les chiffres dans leur globalité pour l’année 2005. Les montants indiqués ne sont pas très précis, car je n’ai pas le temps ni la compétence nécessaires pour faire des recherches approfondies. Merci d’avance aux lecteurs qui en savent plus de bien vouloir m’indiquer les corrections. Cependant les ordres de grandeurs sont bons, et les corrections numériques ne devraient pas changer la conclusion. - les collectivités locales au sens large (communes, départements, régions), et les établissements publics hospitaliers. Les dépenses publiques représentent donc 54% du PIB, c’est leur part dans les biens et les services produits en France en 2005. Ce chiffre doit être mis en perspective. Si on prend comme référence les dépenses publiques en France à la fin du 19ème siècle, elles étaient d’environ 10% du PIB. Dans les pays communistes, je ne connais pas le pourcentage exact, mais la dépense publique était sans doute de 80% voire plus. Nous sommes entre les deux. Quelles sont les conséquences ? - les autres services (…). Ce découpage par type d’activité est plus parlant que le découpage selon les trois types de gestionnaires. Pour déterminer quelles sont les activités qui justifient ou non le recours à l’endettement, nous devons en effet comprendre la nature de chacune d’entre elles, indépendamment du service qui la gère. En particulier, il faut distinguer deux cas, selon que les services publics interviennent en produisant eux-mêmes un service (socialisation de la production), ou en décidant de la manière dont ses fruits doivent être répartis (socialisation des revenus). Le plan est le suivant : chaque tête de chapitre correspond à une activité, et indique son budget. Les questions qu’il faut se poser pour chaque activité sont très simples : « Combien coûte-t-elle ? », « Le système actuel permet-il de la réaliser efficacement et d’équilibrer facilement son financement ? », « Devrait-on recourir à l’endettement pour la financer ? », et « Avons-nous recouru à l’endettement pour la financer ? ». Les transferts sociaux représentent au total 460 Md€ par an, c’est la moitié de la dépense publique, soit 27% du PIB et de très loin le premier poste de dépenses. L’essentiel des transferts est opéré via le régime général de la Sécurité sociale, mais il faut ajouter l’assurance chômage, les régimes complémentaires et les régimes spéciaux de retraites. Ces prestations sont financées principalement par un prélèvement proportionnel sur les salaires. Qu’on les baptise charges salariales ou patronales n’y change rien, les charges sociales sont toujours payées par notre travail et non « par l’entreprise ». Le débat récent sur la « TVA sociale » a obscurci ce point, en laissant croire qu’un changement d’assiette permettrait de faire financer nos prestations par les fonds de pension américains, ou les importateurs chinois. Si nous n’avions pas perdu notre bon sens, nous saurions que c’est impossible et donc faux. Il faut le répéter : seul notre travail peut produire les biens et les services dont nous avons besoin pour nos retraites, en cas de maladie, et en cas de chômage. Les tranferts sociaux ont augmenté très rapidement ces dernières décennies, et la compétence des gestionnaires a consisté à augmenter les prélèvements en même temps que les dépenses. Ils ont hélas fait un travail remarquable, puisqu’on est d’abord frappé par la faiblesse des déficit actuels, soit 1% du PIB, ce qui est relativement peu par rapport au total de 27% de transferts sociaux. On discutera plus loin et en détail les dettes de ces régimes, et on verra que ce 1% ne correspond pas à la réalité, mais il faut souligner dès maintenant que les dépenses, et les dettes correspondantes, sont en-dehors et en plus du budget de l’Etat. Dans quelques cas comme celui des régimes spéciaux de retraites, l’équilibre est si manifestement impossible à atteindre qu’un financement complémentaire a dû être demandé à l’Etat et aux employeurs publics. La subvention de l’Etat est alors comptabilisée dans son budget. A cette remarque près, le système semble aujourd’hui un peu déséquilibré. Ce qui caractérise ces dépenses, ce n’est donc pas leur manque de financement actuel, mais leur taux de croissance exponentiel et le montant des engagements pris et non provisionnés. La mise en œuvre de ce système nécessite des moyens humains, matériels, technologiques très importants. Pour tout contrat d’assurance complémentaire santé, un assureur privé prélève un pourcentage des primes pour gérer le contrat et financer le risque. 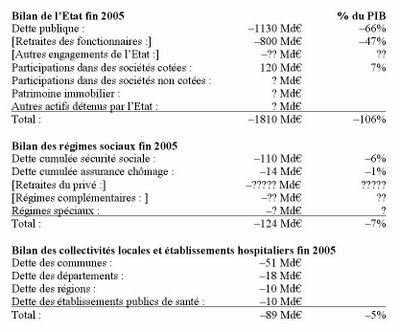 Je ne sais pas comment le coût de gestion de ces services publics se compare au coût de gestion des prestataires les plus efficaces. Les transferts sociaux justifient-ils le recours à la dette ? L'assurance maladie devrait être équilibrée par principe puisqu’elles répartit le risque sur l’ensemble de la population à un instant donné et ne constitue pas une forme d’épargne ni d’échange entre les générations. Que les dépenses d’assurance maladie augmentent est normal dans un pays qui est de plus en plus riche, moins jeune et où nous disposons des traitements les plus avancés. De plus, dans l’ensemble la qualité de notre système de soins est excellente. Mais cela ne nous dit pas combien nous voulons dépenser pour notre santé. Comme les assurés ne paient que 10% environ de leurs soins, et n’en connaissent pas le prix, la régulation de la demande ne peut pas se faire. Certes, on ne va pas chez le médecin pour le plaisir sous prétexte que c’est gratuit. Mais quand on y va on repart souvent avec une ordonnance plus longue et plus coûteuse que si on avait dû payer les soins. Le résultat est que les dépenses augmentent plus vite que ce que nous sommes prêts à payer. L’assurance maladie a déjà généré une dette de 110 Md€ portée par la CADES, et correspondant à des soins passés. L’assurance chômage devrait également être équilibrée, sauf de manière conjoncturelle lors d’une crise économique grave. Mais sa mise en œuvre, avec les différentes allocations d’aide au plus défavorisés, a des effets imprévus qui accentuent le chômage et fragilisent le financement du système. Ces aides créent en effet des trappes à pauvreté qui n’incitent pas les gens – en particulier les plus pauvres – à travailler. Au coût de l’assurance chômage s’ajoute alors le manque à gagner en termes de cotisations sociales et d’impôt sur le revenu d’une personne qui travaille, ce qui revient à multiplier par 2 ou 3 le montant des allocations chômage. Les trappes à pauvreté ne sont pas la seule cause du chômage, mais elles y contribuent. Ainsi, l’assurance chômage cumule déjà une dette de 14 Md€ qui est portée par l’UNEDIC. Elle est déficitaire en 2005, malgré une croissance raisonnable comprise entre 1,5% et 2%. La retraite devrait aussi être équilibrée si les droits à pension étaient provisionnés, mais ce point très important doit être expliqué. La retraite constitue une forme de consommation différée, et qu’elle soit par répartition ou par capitalisation ne fait guère de différence contrairement à ce que l’on pense souvent. Tel que le système par répartition est conçu, les cotisations passées ouvrent des droits à pension, et seul le mode de calcul et la gestion financière diffèrent d’un système par capitalisation. En revanche, les deux systèmes n’ont pas du tout les mêmes effets en ce qui concerne les incitations au travail, la tendance à être naturellement en (dés)équilibre financier, et les tensions sociales. La retraite par répartition a pour talon d’achille les bosses démographiques comme le papy boom, et l’augmentation de l’espérance de vie, qui augmentent temporairement le nombre de retraités par rapport aux actifs. De plus, elle incite chaque catégorie de salariés à cotiser le moins possible et à réclamer la pension la plus élevée possible. Quand on ne sait pas exactement combien on paie, on a tendance à crier « moins ! », et quand on ne sait pas combien on touchera, on a tendance à crier « plus ! ». La retraite par répartition est donc par nature instable, et il faudrait des gestionnaires ayant une poigne de fer pour maintenir l’équilibre. De ce fait, les actifs d’hier ont relativement peu cotisé parce qu’il y avait peu de retraités, et les régimes sociaux n’ont pas constitué de réserves pour tenir compte de l’évolution démographique prévue. Sur la base de ces cotisations insuffisantes, on a promis des pensions que les futurs actifs auront beaucoup de mal à payer. Or plus un actif est âgé, et plus il cumule des droits à pension. Pour l’instant, les engagements pris continuent donc d’augmenter avec la population et l’âge moyen des actifs. Comme il est hors de question de laisser des gens dans le dénuement après une vie de travail, nous allons payer ces pensions, c’est une obligation morale. 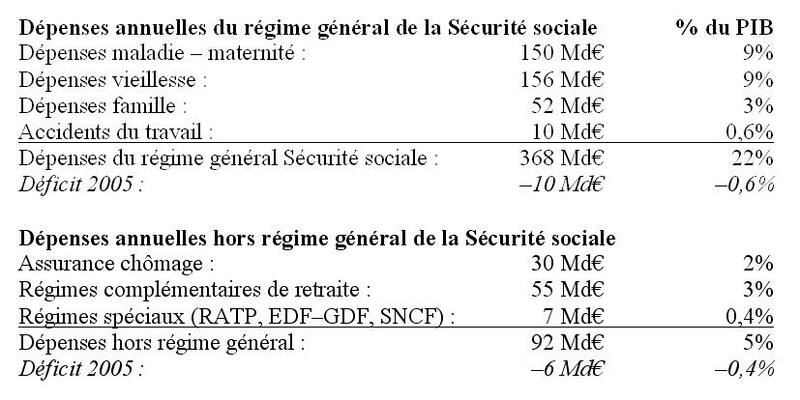 Mais si on veut rendre compte de la situation des régimes sociaux, ces promesses de pensions sont bien équivalentes à une dette de 800 Md€ pour les fonctionnaires et une dette de ????? Md€ pour les salariés du privé (le nombre de points d’interrogation est censé donner une indication du montant…). Les régimes complémentaires fonctionnent sur le même modèle par répartition et ont exactement les mêmes défauts que le régime général. Ils sont mieux équilibrés pour l’instant, mais pour combien de temps ? Leurs engagements correspondent également à une dette de ?? Md€. Les régimes spéciaux sont un exemple de catégorie de salariés dont les syndicats ont obtenu qu’ils puissent cotiser moins que les autres et obtenir des pension revalorisées. Ils ont ainsi obtenu des droits spécifiques (âge précoce, calcul et revalorisation annuelle de la pension) qui sont équivalents à une augmentation d’environ 35% des pensions. Ces régimes sont donc déjà très déficitaires. Ils comptent 500,000 bénéficiaires et 361,000 cotisants. Sans renégociation, les engagements pris à l’égard des salariés des régimes spéciaux correspondent à une dette de ? Md€. « Pourquoi abandonnerions-nous nos avantages acquis ? », disent les retraités qui pensent avoir acheté leurs droits en cotisant. « Pourquoi les paierions-nous ? », répondent les actifs qui n’arrivent pas à les financer. Le drame de notre système est qu’il dresse différentes parties de population les unes contre les autres. Pour chacun de ces régimes de retraite, il existe un conflit d’intérêt entre les bénéficiaires et les payeurs. Faute d’avoir un système de prix qui permettrait à chacun de décider pour lui-même, la résolution de ces conflits par nos institutions fera des mécontents, et nous risquons d’en payer le prix en termes de cohésion sociale. La capitalisation n’a pas ces défauts. On lui reproche d’être soumise aux aléas des bulles financières, mais c’est un mauvais argument pour des durées moyennes d’épargne supérieures à 20 ans. Il est vrai qu’elle oppose les salariés et les actionnaires, mais au moins le partage de la valeur ajoutée est régulé par le marché et historiquement très stable. Ce partage est d’environ 2/3 pour le travail et 1/3 pour le capital dans tous les pays développés. La seule faiblesse de la capitalisation est l’inflation, puisqu’en cas de dépréciation de la monnaie, les sommes épargnées perdent de la valeur. Mais la conclusion logique est que nous devons maîtriser l’inflation, ce qui est maintenant chose faite. Remplacer la capitalisation par la répartition en raison de l’inflation revient à justifier une erreur par une autre erreur. Pour sortir du système par répartition il faudrait en théorie rembourser intégralement la dette en payant aux cotisants les droits qu’ils ont acquis. On voit mal comment cela pourrait se faire avant plusieurs années, et encore avec une transition très progressive. Les redistributions justifient-elles le recours à la dette ? La redistribution consiste à effectuer des transferts des uns vers les autres. Une partie de transferts, dits efficaces, permettent de corriger les inefficacités du marché (monopole naturel, asymétrie d’information, externalités, aléa moral, antisélection). Ils permettent donc d’accroître la production de richesses globale. Mais ce n’est généralement pas à cela que l’on pense quand on parle de transferts. L’immense majorité de nos tranferts prétendent lutter contre les inégalités, en mettant en œuvre une redistribution pure des plus favorisés vers les moins favorisés, quitte à diminuer la production de richesses globale. Quels sont les résultats ? - l’éducation, en particulier l’enseignement supérieur gratuit, est une autre prestation en nature qui profite plus aux riches, dont les enfants peuvent se permettre de retarder l’entrée dans la vie active (redistribution inverse). Quels que soient les objectifs poursuivis – et ce sont des objectifs tout à fait respectables –, la redistribution pure ne justifie aucun endettement. Lorsqu’on prend aux riches pour donner aux pauvres, cela ne devrait générer aucune dette. Ce qui génère de la dette, c’est de s’endetter pour consommer aujourd’hui et rembourser demain. Ce qui la rembourse, c’est d’épargner aujourd’hui pour consommer demain. Cela relève d’une décision privée qu’aucun gestionnaire public ne devrait faire à notre place, sauf l’Etat dans un cas bien précis que l’on discutera plus loin : l’investissement en infrastructures dont on verra qu’il n’est plus très important. Mais il est aujourd’hui évident que nous avons demandé à l’Etat et à la Sécurité sociale de distribuer de l’argent qu’ils n’avaient pas ainsi que des droits non provisionnés. Le manque de traçabilité fait qu’il sera difficile – mais pas impossible – de savoir qui sont les perdants et qui sont les gagnants. De nouveau, cela risque de dresser différentes parties de la population les unes contre les autres. Etat, collectivités locales, établissements publics de santé : combien ? Je laisse de côté la question de savoir si l’éducation et l’enseignement supérieur doivent faire partie du secteur public en totalité, en partie ou pas du tout. Dans tous les cas, ces services doivent être financés l’année où ils sont produits. Certains contestent ce principe en affirmant que l’éducation est un investissement en capital humain, qui génerera de la croissance demain et se remboursera tout seul. C’est faire une grave confusion entre un individu et un pays. S’endetter pour payer ses études a un sens au niveau d'un individu qui sait qu’ensuite il travaillera pour rembourser. Mais cela n’a aucun sens au niveau d'un pays : qu’est-ce qu’un pays qui étudie pour travailler plus tard ? Quand la démographie est stabilisée, il y a un nombre à peu près constant d’élèves, d’étudiants et d’actifs. En régime de croisière, le financement doit être équilibré entre ceux qui étudient encore et ceux qui sont déjà entrés dans la vie active. Pourtant, il est probable que le financement de l’éducation et de l’enseignement supérieur ont conduit au creusement de la dette sous la pression d’une catégorie de la population bien syndiquée qui a pu défendre ses intérêts. On ne peut en déterminer le montant exact car il n’est pas isolé au sein du budget. De plus, on ne peut parler de cette dette sans soulever la question de l’efficacité avec laquelle ce service public a été produit, puisque ses clients – en l’occurrence les parents – ont eu très peu leur mot à dire. Au final, son montant est inclus dans la dette globale de l’Etat et dans les engagements de retraites des fonctionnaires. Environ un million de fonctionnaires travaillent dans ce secteur sur un total de cinq millions. 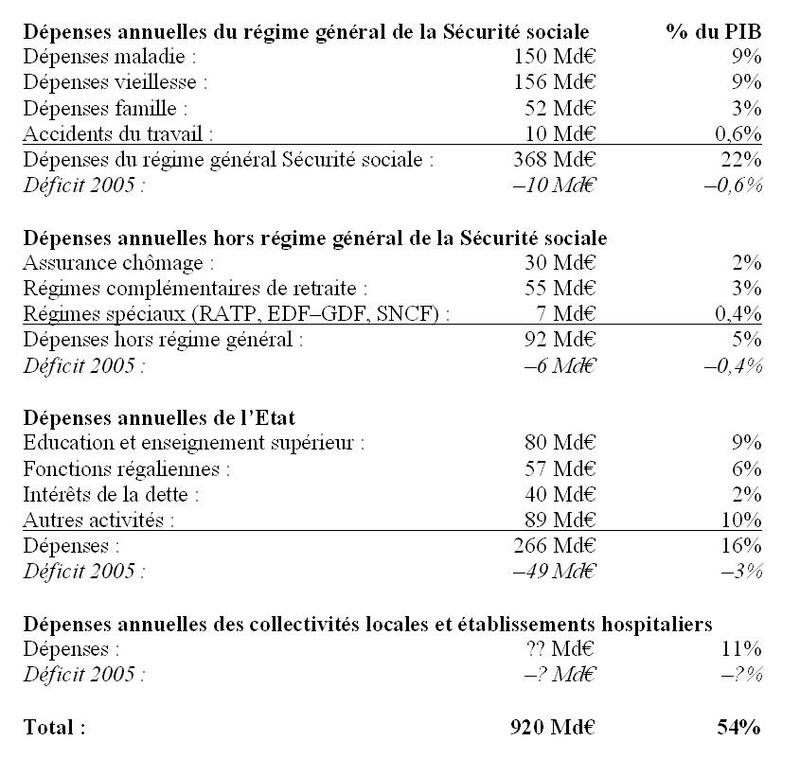 Les fonctions régaliennes de l’Etat que sont l’armée, la sécurité et la justice devraient être financées par les recettes fiscales de l'année. Elles ne nécessite aucun endettement : on s’endette généralement pour payer sa maison, pas la société de surveillance. Au début, il y a bien sûr une part d’investissement dans le matériel militaire, de police, et les bâtiments. Mais lorsque les fonctions régaliennes existent depuis longtemps comme chez nous, le budget annuel suffit pour renouveler le matériel obsolète au fur et à mesure par des équipements plus modernes. Il semble que, du fait de l’état de nos finances publiques, les fonctions régaliennes sont particulièrement mal financées en France et doivent souvent se contenter de matériel de qualité médiocre. En plus des fonctions régaliennes, l’Etat et les collectivités locales gèrent de nombreuses activités dont l’intérêt est très variable. Leur justification habituelle est qu’elles sont de l’intérêt général et « produisent » des résultats pour la collectivité qui ne pourraient pas être obtenus par l’initiative privée. L’argument est que, comme elles bénéficient à toute la collectivité, personne n’aurait intérêt – égoïstement – à financer ces activités si on laissait faire le marché. Et en effet, ces activités produisent des résultats : le programme TGV a produit un train magnifique, des infrastructures, des emplois chez Alstom, des passagers, que chacun peut voir. Mais les impôts qui ont payé ce programme sont autant d’emplois privés en moins, et de consommation privée en moins. Admirer le résultat d’un programme public est très sympathique, mais cela a peu de sens si on ne le compare pas à ce qu’auraient été en son absence les myriades de projets privés. On ne voit pas ce qui n’existe pas. Combien ont coûté tous ces projets moins reluisants que le TGV, si nombreux et si peu utiles ? Combien de projets réellement utiles n’ont pu être financés du fait de ce gaspillage ? Sur ce montant, les transferts sociaux ont déjà été longuement discutés. Nous avons également vu l’éducation et l’enseignement supérieur, les fonctions régaliennes, et les investissements en infrastructure qui figurent ici dans les autres activités de l’Etat ainsi que dans le budget des collectivités locales. Restent les intérêts de la dette publique, qui représentent déjà plus de 2% du PIB. Un premier pas pour y voir plus clair en termes de budget et de dette a été franchi avec la Loi Organique relative aux Lois de Finance (LOLF). Elle permettra de répartir les financements par projets, d’en évaluer les résultats, et de connaître chaque année l’état des dettes et du patrimoine publics. Tant qu’elle n’est pas complètement en place, on ne peut se faire qu’une idée approximative de la dette des institutions publiques qui est récapitulée dans le tableau suivant. Les engagements, ou droits à retraites, sont mis entre crochets pour les distinguer des dettes sonnantes et trébuchantes. - le patrimoine immobilier comprend des bâtiments qui sont occupés par des fonctionnaires, et des monuments historiques qu’il faut entretenir, et vendre les premiers diminuera la dette mais obligera à payer un loyer ce qui n’améliorera en rien les finances publiques, tandis que les seconds sont un passif plutôt qu’un actif. Les ordres de grandeur nous permettent de voir immédiatement que la dette de l’Etat n’est pas justifiée par les investissements publics. La dette a été multipliée par 5 en valeur réelle depuis 1980, date à laquelle la plupart des investissements en infrastructure réalisés après la guerre étaient terminés. On ne peut en aucun cas dire que la dette publique actuelle est justifiée par les infrastructures que nous léguons aux générations futures. Malgré tout, on pourra probablement diminuer la dette publique en vendant une part significative du patrimoine de l’Etat, mais il ne faut pas s’attendre à des miracles. De plus, il y aura une opposition très forte des salariés qui travaillent dans ces entreprises publiques, et des syndicats qui défendent leurs intérêts : encore une partie de la population dressée contre une autre. L’essentiel de notre dette publique n’est donc pas justifié par des investissements en infrastructures. On a vu que ni l’assurance maladie, ni l’assurance chômage, ni l’éducation, ni l’enseignement supérieur, ni les fonctions régaliennes ne pouvaient justifier notre endettement. La redistribution pour lutter contre les inégalités, encore moins ! Non, c’est autre chose, mais quoi ? Un peu de patience, nous approchons de la vérité. Les engagements de l’Etat au titre des retraites des fonctionnaires sont de 800 Md€. Mais cela ne prend pas en compte les retraites du privé, ni les régimes complémentaires, ni les régimes spéciaux. Pour se faire une idée de ces autres engagements, il faut se poser la question suivante : puisque les retraites des fonctionnaires représentent 800 Md€, combien pèsent les droits à retraite de tous les actifs du privé ? Si il y a cinq millions de fonctionnaires en France, les salariés du privé sont bien plus nombreux, plus de quinze millions. Le montant est sans aucun doute astronomique, c’est pourquoi j’ai indiqué ce montant par ????? dans le tableau. Il faut le répéter : le fait que ces droits à retraite n’ont pas été provisionnés signifie que les régimes sociaux n’ont pas épargné pour la retraite de leurs cotisants comme n’importe quel ménage l’aurait fait. Non seulement il n’existe aucune réserve, mais ces régimes ont même quelques dettes, ce qui est un comble ! D’un côté, on peut penser que la plupart de ces engagements ne seront jamais remboursés, et qu’on pourra continuer de repousser la dette dans la mesure où les nouveaux cotisants payeront les pensions des retraités. Par la force des choses, c’est peut-être ce qui va se passer, mais il faut bien en mesurer les conséquences. Un jeune qui entre dans la vie active sait qu’il va devoir payer la pension de ses aînés. On appelle souvent cela du doux nom de solidarité, mais c’est un faux geste de solidarité, car c’est une solidarité obligatoire. Les jeunes en veulent à leurs aînés de les avoir mis dans cette situation, c’est une des conséquences d’un système qui dresse des parties de la population les uns contre les autres. Ensuite, il devient très tentant pour un jeune de laisser les autres se charger de cette corvée, en partant à l’étranger ou en ne travaillant pas. Mais ce sont rarement les enfants des familles les plus modestes qui peuvent se permettre ce genre de comportement. Eux savent qu’ils resteront en France, et qu’ils hériteront des sommes modestes. Ils vont devoir travailler, et travailler en France, on peut en être certains. Mais leur travail ne leur appartient plus, du fait des prélèvements actuels : 55% aujourd’hui, combien demain ? Ceux sont eux qui sont les plus à plaindre car ils ont perdu l’essentiel de leur liberté économique. Une grosse partie visible de nos dettes correspond à la dette de l’Etat et des collectivités locales, même en tenant compte de la vente de certains actifs publics. Mais la partie invisible est donc la plus importante. Il s’agit des engagements de retraites non provisionnés et des transferts sociaux non financés. A quoi sont dûes ces dettes visible et invisible ? La principale raison de la dette visible est que l’Etat a été financé à crédit, en accroissant le périmètre de ses activités et en embauchant des fonctionnaires. Pour la dette invisible, l’explication est un peu différente. Comme les retraites par répartition n’étaient pas généralisées en France après la guerre, il n’y avait alors aucune dette invisible. En 60 ans, nous avons distribué des droits à retraite pour 800 Md€ aux fonctionnaires et pour un montant bien plus important aux salariés du privé. Cette dette est invisible parce que nous avons distribué des droits et non de l’argent, mais le résultat est le même, car à la fin seul notre travail permettra de produire les biens dont nous avons besoin pour notre retraite. C’est facile à comprendre. Chacun d’entre nous a, à un moment ou à un autre, demandé à l’Etat de lui distribuer de l’argent, de lui fournir des services, un emploi, des droits à retraite, et en même temps de réduire ses impôts. Premièrement, en demandant toutes sortes de services, nous avons incité l’Etat à grossir sans nous rendre compte que cela allait créer de plus en plus de monopoles et de bureaucratie inutile. On se souvient que, dans les années récentes, on a parfois justifié cette politique au prétexte que produire des services publics permettait de « créer des emplois ». Deuxièmement, le système lui-même incite chaque individu ou groupe à demander des avantages pour lui, que ce soit sous forme d’argent tout de suite ou sous forme de droits pour plus tard, sans se soucier de savoir qui paiera. L’Etat a une petite part de responsabilité, mais on ne peut pas dire que cette situation existe simplement parce que nos dirigeants ont été incompétents. Si notre système fonctionne uniquement lorsqu’on place un homme ou une femme exceptionnels à sa tête, et ne marche pas dans les autres cas, c’est un très mauvais système. Et il y a de nombreux hommes et femmes exceptionnels aux commandes des administrations. Si nous voulons connaître le vrai responsable, il nous faut plutôt regarder dans un miroir ! A présent, il nous faut donc comprendre quelle est la signification de la dette visible et invisible, et les deux mécanismes qui ont conduit à la créer : l’embauche de fonctionnaires (socialisation de la production), et la distribution d’argent et de droits (socialisation des revenus). Pour finir, nous dirons un mot de deux tours de passe-passe qui ont souvent été utilisés pour financer les dépenses de l’Etat : l’inflation et la fausse croissance. Nous conclurons qu’aucune de ces recettes ne marche, et verrons comment faire face à la réalité. La redistribution du patrimoine consiste à prendre aux riches pour donner aux pauvres. Au début du 20ème siècle, la société française était nettement séparée entre les travailleurs et les rentiers. Ces derniers étaient peu nombreux puisque les 1% les plus riches de la population percevaient 21% du revenu national, essentiellement grâce aux revenus d’un patrimoine dont ils héritaient à la naissance. Aujourd’hui, ce pourcentage est descendu à environ 7%, et est dû essentiellement aux différences de salaire entre les travailleurs. Le patrimoine des rentiers a largement disparu, principalement du fait de l’inflation et des destructions causées par les deux guerres. Les riches et les pauvres aujourd’hui se distinguent surtout par leur travail. Les plus riches sont ceux qui ont le travail le mieux payé, or les différences de rémunération n’ont pratiquement pas varié au cours du 20ème siècle. Dans ces conditions, taxer les gros patrimoines revient comme on l’a dit plus haut à taxer les fourmis deux fois : une fois sur leur travail et une fois sur leur épargne. La principale conséquence serait d’inciter les fourmis à être cigales, et on ne voit pas vraiment l’intérêt. La seule redistribution, qui pourrait avoir un effet sur les inégalités, est donc celle allant des hauts salaires vers les bas salaires. Voyons ce qu’il en est. La redistribution des salaires consiste à prendre aux hauts salaires pour donner aux bas salaires. Mais plus on redistribue, moins l’économie produit de biens et de services. Imaginons un ouvrier très qualifié, et un ouvrier non qualifié. Le premier est embauché pour 2000€ par mois, et le second pour 1000€, dans la même usine. L’ouvrier peu qualifié considère que le talent de l’autre, qu’il résulte de son hérédité, de ses études, ou de la meilleure situation de sa famille, ne justifie pas un tel écart de salaire. Il demande à ce que tous les mois, l’ouvrier qualifié lui reverse 200€. Quand on ne regarde que la situation à court terme de ces deux ouvriers, leurs salaire effectifs sont donc de 1800€ et 1200€ respectivement, et l’inégalité entre eux a été réduite. 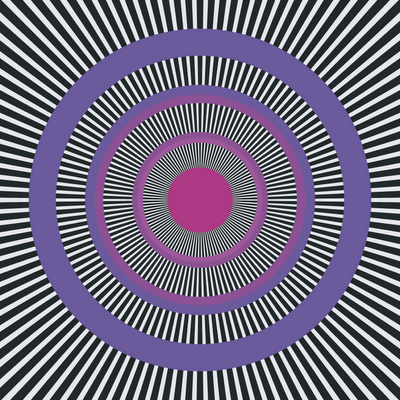 Mais on ne peut juger une telle mesure qu’en regardant ses effets sur tous les groupes et sur toute la population, à court terme comme à long terme. Les autres ouvriers qualifiés, dont les compétences leurs permettraient de gagner 2000€ dans cette usine uniquement, seraient bien avisés d’aller travailler ailleurs pour un salaire de 1801€, 1802€, etc. ou 1999€. Dans la plupart des autres usines ils produiront moins de richesses, c’est pourquoi ils seront payés moins de 2000€, mais leur situation personnelle sera meilleure sans le prélèvement de 200€. A l’inverse, des ouvriers moyennement qualifiés qui ne peuvent gagner que 1001€, 1001€, etc. ou 1199€ ailleurs, feraient bien de démissionner pour se faire embaucher dans cette usine-ci. Là où ils sont aujourd’hui, ils produisent plus de richesses, c’est pourquoi leur salaire est supérieur à 1000€, mais ils amélioreront leur situation personnelle avec la prime de 200€. Quel est le résultat pour l’ensemble de la société ? Les inégalités de salaires ont été réduites, mais maintenant certains ouvriers qui pouvaient produire 2000€ produisent moins, et certains ouvriers qui pouvaient produire entre 1000€ et 1200€ ne produisent plus que 1000€. La production totale a baissé, soit parce que les quantités sont plus faibles, soit parce que les biens produits sont moins utiles pour les clients. Il y a donc des clients, et des ouvriers qualifiés, dont la situation s’est dégradée. Il faut penser à eux, et pas seulement aux ouvriers peu qualifiés dont la situation s’est améliorée. Si on additionne les gains et les pertes de tous les groupes, le bilan global est négatif. Cela peut être acceptable jusqu’à un certain point, mais il faut en être conscient. L’embauche de fonctionnaires est parfois considérée comme une bonne chose, parce qu’elle permet de créer des emplois. En réalité, ce n’est qu’un cas particulier de redistribution des hauts salaires vers les bas salaires. Une personne qui a un salaire de 1000€ parvient à être embauchée dans la fonction publique pour 1200€. Quand on ne regarde que cette personne, sa situation personnelle est améliorée. Mais si l’on prend en compte les contribuables, ils vont maintenant acheter avec leurs impôts les services de ce nouveau fonctionnaire. Le prix qu’ils vont payer est de 200€ plus élevé que ce qu’ils payaient en achetant les biens et services que cette personne produisait avant. On a donc prélevé 200€ sur les hauts salaires pour donner une prime à une personne ayant un salaire modeste. Les 200€, que le haut salaire utilisait pour payer des biens, des services et des emplois privés, est maintenant donnée à quelqu’un sans contrepartie. Les inégalités de salaire sont réduites, mais la valeur globale des produits et services a diminué. Ces 200€ servaient à acheter des biens et services, et à payer des emplois privés qui maintenant n’existent plus. C’est difficile à prouver parce qu’on ne saura jamais précisément ce qui n’est plus produit, ni les emplois qui ont été détruits ailleurs, ils sont trop diffus, mais c’est la réalité. Le lecteur n’est peut-être pas encore convaincu. Après tout, les prélèvements sur le patrimoine, sur les hauts salaires, et l’embauche de fonctionnaires semblent être des bonnes choses pour les petites gens. Si les plus favorisés doivent en souffrir un peu, leur situation ne deviendra pas très mauvaise pour autant. Peut-être la production globale de biens et de services sera-t-elle un peu diminuée, mais c’est une notion très floue, tandis que l’amélioration du sort des pauvres gens est un résultat tangible. Où est le mal ? Comme toujours, il faut le chercher du côté de ce qu’on ne voit pas. La naïveté du raisonnement consiste à croire que les riches sont les seules victimes de ces politiques. On sait ce que sont devenus les 200€ qu’on a prélevés sur le haut salaire, ou sur le patrimoine. Mais à quoi servaient-ils avant qu’on les prélève ? Ce n’étaient pas des billets qui dormaient sous un matelas, mais le fruit d’un travail qui servait à acheter des produits et services et donc à payer un autre travail. Dans certains cas, ces 200€ servaient à payer une babysitteuse, une employée de maison, un repas au restaurant et un pourboire à la serveuse. Dans d’autres cas, ils servaient à payer une bouteille de vin hors de prix et le salaire des vendangeurs et des viticulteurs, ou une nuit dans un hôtel trois étoiles. Globalement, moins de biens et de services sont produits, et bien souvent ces richesses étaient produites par des petites gens comme celle que l’on a voulu protéger. Les principales victimes de ces politiques sont les petits salariés dont on a ainsi supprimé l’activité. Mais, et c’est là le plus étonnant, la personne que l’on croyait aider est elle-même une victime. Alors qu’elle avait un petit emploi et l’ambition d’en trouver un meilleur, elle est maintenant assistée, infantilisée, retenue sur son poste par une prime de 200€, et elle est insatisfaite car elle a l’impression d’être moins utile qu’avant et d’avoir perdu ses ambitions. En embauchant des fonctionnaires pas vraiment indispensables et en distribuant de l’argent, tout cela a été accompli et de la dette a été créée. Cela partait d’une bonne intention, mais même si l’intention était bonne, il faut reconnaître que le résultat est très mauvais. La distribution de pouvoir d’achat consiste pour l’Etat à s’endetter pour donner de l’argent à quelqu’un contre rien. Avec cet argent, le bénéficiaire va pouvoir acheter un repas, le restaurateur va utiliser ce revenu pour acheter une paire de chaussures, ce qui va permettre au cordonnier d’acheter une chemise et d’enrichir le tailleur, et on a « relancé l’économie ». Encore plus fort : grâce aux impôts que paieront le restaurateur, le cordonnier et le tailleur, la dette de l’Etat se remboursera toute seule. Inutile de dire à quel point ce raisonnement est faux. La dette devant être remboursée demain, tous ces produits consommés aujourd’hui ont une contrepartie. Et cette contrepartie, ce sont des repas, des chaussures et des chemises qui ne seront pas produits ni consommés demain. Même si cette explication est grossière, on peut comprendre ce qui se passe en pensant au dicton « un tiens vaut mieux que deux tu l’auras ». Une chemise aujourd’hui vaut plus qu’une chemise demain. Il faudra donc se priver de plusieurs chemise demain pour rembourser la chemise d’aujourd’hui. Ce n’est pas vraiment ce qu’on peut appeler une dette qui se rembourse toute seule. Et encore n’est-ce pas le pire défaut de ce système, car il crée une injustice encore plus flagrante. Contrairement à la redistribution des salaires qui consiste à prendre une chemise au riche pour la donner tout de suite au pauvre, la distribution de pouvoir d’achat consiste à donner une chemise à quelqu’un aujourd’hui pour en prendre deux à quelqu’un d’autre demain, indépendamment de savoir qui est pauvre ou riche ! La distribution de droits à retraite sans provisions est maintenant simple à comprendre. C’est de la distribution de pouvoir d’achat, mais demain au lieu d’aujourd’hui. Faute de traçabilité, on ne sait pas exactement à qui a été distribué le plus de pouvoir d’achat futur, ni qui le paiera. L’Ecole Polytechnique dont je suis issu réussit l’exploit de cumuler tous ces défauts simultanément (et heureusement quelques qualités… ;-). Les élèves qui y rentrent à 20 ans sont parmi les étudiants les plus brillants du pays. Leurs parents, qui en moyenne sont également des gens brillants, ont souvent une situation qui leur permettrait de payer les études de leurs enfants. Au lieu de cela, non seulement les études sont gratuites, mais les élèves de l’Ecole Polytechnique reçoivent un salaire pendant leurs études, et « cotisent » pour leur future retraite dès l’âge de 20 ans ! Ils bénéficient donc à la fois d’une distribution de pouvoir d’achat et d’une distribution de droits à retraite sans provisions. Dans ces conditions, il est triste, mais pas complètement étonnant, de voir les étudiants universitaires réclamer un « salaire étudiant ». Pour couronner le tout, une part importante des Polytechniciens deviennent automatiquement fonctionnaires à la sortie de l’Ecole, et cumulent donc une embauche de fonctionnaire aux avantages précédents. C’est une manière très efficace de détruire de la richesse et de créer de la dette. Voici les meilleurs skieurs de la station : on les monte en hélicoptère au milieu de la piste pour leur dire ensuite que si ils veulent ils peuvent se laisser glisser, alors qu’ils auraient la capacité de grimper au sommet. Beaucoup le font quand même, heureusement, et ils ont du mérite ! Cela fait bientôt 20 ans que j’ai passé le concours, et il m’a fallu tout ce temps pour comprendre. L’inflation a souvent été utilisée par les gouvernements pour financer leurs dépenses en faisant tourner la planche à billets. Comme la monnaie se déprécie, les épargnants voient leur palcements fondre comme neige au soleil, et ceux qui ont consommé – notamment en achetant leur maison – s’enrichissent. Dans ces conditions, il vaut mieux acheter une maison qu’investir dans une entreprise car les actions seront progressivement dévalorisées. Il vaut mieux consommer tout de suite qu’épargner. C’est une forme insidieuse de redistribution des fourmis vers les cigales. La croissance est toujours présentée comme la voie du salut. Il est vrai qu’avec 4% de croissance on n’a pas les mêmes problèmes pour financer la dépense publique qu’avec 2%. Mais que mesurent ces pourcentages ? Ils mesurent toute la production de biens et de services, qu’ils soient publics ou privés. Le gros défaut de cette mesure est donc de comptabiliser les dépenses publiques comme de la croissance. A qui devons-nous rembourser la dette et comment faire ? Pour revenir aux 54% du début, nous sommes sans doute déjà un peu plus proches de l’ex-URSS que d’une économie libérale. Si aucun Français n’a l’impression de vivre dans un pays soviétique, c’est parce que la liberté politique reste importante, bien que certaines libertés individuelles comme la liberté d’expression aient déjà diminué. Mais sur le plan économique, qu’est-ce qui nous distingue d’un pays communiste ? Principalement le fait qu’il reste encore de la propriété privée, et l’illusion que le coq français est économiquement plus compétent que l’ours russe. Ce serait oublier que l’état soviétique a longtemps fait illusion. Au début des années 1980, certains s’interrogeaient encore sur la capacité d’une économie de marché à produire des richesse aussi efficacement qu’une économie centralisée, et « scientifiquement planifiée », telle que celle de l’URSS. Economiquement, il n’y a pas de différence de nature entre nous et l’ex-URSS, juste une différence de degré. Nous sommes heureusement encore loin de l’état de décomposition que l’économie soviétique avait atteint au moment de la chute du mur. Mais nous allons dans la mauvaise direction et la distance se réduit peu à peu. Quelle est la bonne nouvelle ? Nous sommes un pays riche, l’Etat a une notation excellente sur les marchés financiers, ce qui montre que son crédit n’est pas encore entamé. Nous avons donc les moyens de nous sortir du pétrin. Quelle est la mauvaise nouvelle ? La même ! Nous sommes un pays riche, l’Etat a une notation excellente sur les marchés financiers, ce qui montre que son crédit n’est pas encore entamé. Nous pouvons donc attendre encore un peu avant de nous sortir du pétrin. Ce qui nous manque, ce n’est pas la capacité à bouger, c’est la motivation. A présent, je comprends que la dette n’a pas du tout la signification que je lui donnais en commençant ce travail. Ce n’est pas comme un ménage qui a acheté à crédit des vacances trop chères et doit maintenant rembourser. Nos dettes sont, pour l’essentiel, le résultat d’un système qui prend aux uns pour redistribuer aux autres. Nous avons mis en place ce système avec les meilleures intentions du monde, mais cela ne change rien au résultat. La première chose à faire pour rembourser la dette est donc d’arrêter ses causes : arrêter la distribution de droit à retraite sans provisions, arrêter la distribution de pouvoir d’achat, arrêter l’embauche de fonctionnaires. Cela ne peut pas se faire de façon brutale. Mais il faut être lucides : même en prenant notre temps le remède sera amer et, pendant une certaine période, pire que le mal. Comme souvent, les excès sont généralement agréables au début et douloureux à la fin, mais pour les remèdes c’est l’inverse. Nous devons l’accepter et nous hâter pour commencer le plus vite possible.